In the theme of budget planning, this month I tried out a really simple beef stew (recipe here) with a simple salad of greens, peppers, and tomatoes tossed in a balsamic vinaigrette (recipe here). Itemized spending: $12 on 2 lb of beef, $4 on potatoes and beef broth, and $5 on salad greens and other bits… so about $20. Not as cheap as I’d hoped, but a bit better than last month! 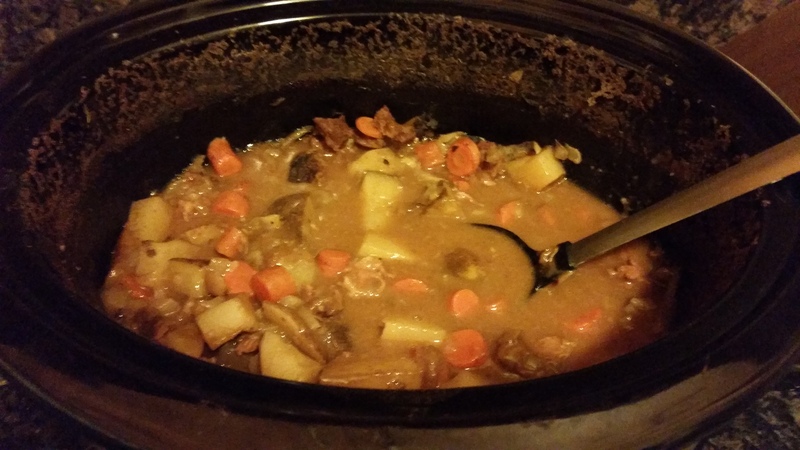 The beef stew was actually pretty good! I ended up doubling the amount of beef broth and other spices (garlic, paprika, salt, etc.) to make sure the meat was covered and to make sure the flavors came through. It’s not quite as flavorful as I’d like, but I’m hoping it’ll taste better after sitting overnight. On a “lighter” note, Lindsey bought me a useful recipe book: The Carbohydrate Addict’s Cookbook. I AM NOT AN ADDICT. Carbs are delicious, filling, and all in all The Best. But I should probably cut back on them. Will try some recipes this month and keep everyone posted (especially Lindsey)!